Our commitment to quality begins with the details that matter most to you. JM PVC solutions fit a wide range of applications, are fast and simple to install, and come in a variety of fitting styles and colors. Each piece is manufactured from high impact PVC material designed to provide abuse-resistant, vapor retardant protection to insulated pipes. Contractors, designers, and building owners can appreciate the lower overall costs, long-lasting protection and attractive finished appearance JM PVC products provide. At JM, our dedication to quality research, design and manufacturing of our PVC products reflects our commitment to you and the buildings you create. Johns Manville Zeston® 2000 Series standard gauge PVC fitting covers are manufactured from high-impact, UV-resistant, polyvinyl chloride material designed to provide abuse-resistant protection for insulated piping. Our wide range of products and accessories enable the contractor to design, fabricate and install a complete system with a quality finished appearance. When combined with JM's PVC jacketing and solvent welding adhesive or Z-tape, our PVC fitting covers form a completely sealed system that may be used for applications below ambient conditions. Johns Manville Zeston® 2000 Series Color standard gauge PVC fitting covers are manufactured from high-impact, polyvinyl chloride material designed to provide abuse-resistant protection for insulated piping. The one piece color fittings are available with or without Hi-Lo® Temp Formaldehyde-free fiberglass inserts. Our wide range of products and accessories enable the contractor to design, fabricate and install a complete system with a quality finished appearance. Johns Manville Zeston® 300 Series PVC fitting covers are made from a thick gauge material that provides superior impact resistance and increased durability for high abuse areas in industrial and commercial applications. Zeston 300 Series PVC fitting covers are manufactured from a glossy, high-impact, UV-resistant material. Our wide range of products and accessories enable the contractor to design, fabricate and install a complete system with a quality finished appearance. When combined with JM's PVC jacketing and solvent welding adhesive, our PVC fitting covers form a completely sealed system that meets USDA and FDA requirements for applications in food, beverage and pharmaceutical facilities. Accessories that provide a uniform finished appearance. The Johns Manville Zeston® PVC Accessories lines include welding adhesive, adhesive applicator, tacks, thinner and tape. They complete a systems package that features ease of installation, uniform appearance and optimum, long-term insulation protection when used together with Zeston PVC products. A complete PVC system, using components and accessories that are fully integrated, will give you an easy-to-install, professional job that offers excellent performance with a clean finished appearance. 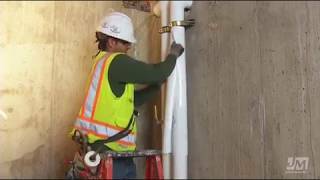 Zeston jacketing is made from high impact polyvinyl chloride material designed to provide an inherent vapor retarder and protection to insulated pipes. Standard thicknesses and widths available in an array of colors, as well as UV-resistant white.